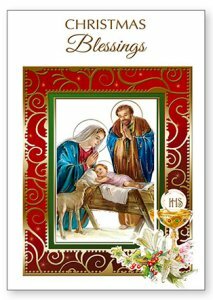 DIVINE CHRISTIAN GIFTS - Holy Family Christmas Priest Card. Holy Family Christmas Priest Card. You will have a special remembrance in the Holy Sacrifice of the Mass on Christmas Day, May Peace and Happiness be yours this Christmas and throughout the New Year.